The purpose of the AkroDYNE® Truck Tire Dynamic Balance System is to help assure tire quality for Truck and Bus radial tires. This is done by measuring, grading, marking and sorting tires according to static, couple, and upper and lower plane imbalance. All Micro-Poise dynamic balancers utilize a “force measuring” imbalance-sensing system in conjunction with computer based software. There are several advantages to this system. The force measuring system accurately measures the imbalance in a wide variety of tires, regardless of their weight. The primarily digital electronics are very stable and allow the machine to be calibrated for all production tires. Tires are measured while inflated and rotating. Static Imbalance in a tire can create disturbances such as tire bounce. Static imbalance can be caused by a heavy spot (or light spot) on the tire tread. This condition will induce an up and down force into the vehicle on every tire rotation. These forces are amplified as the speed of the vehicle increases. Couple Imbalance in a tire can create disturbances such as tire wobble. Couple imbalance can be caused by an improperly mounted tire or a heavy spot (or light spot) in a tire sidewall. This condition will induce a side-to-side shake or wheel shimmy into the vehicle on every tire rotation. These forces are amplified as the speed of the vehicle increases. Upper and Lower Plane Imbalance is the amount of weight required to correct for both static and couple imbalance of the tire as described earlier. Tire and Automotive manufacturers set limits on the acceptable values of static, couple and per plane imbalance forces to assure good ride quality and customer satisfaction. The AkroDYNE® Truck Tire Dynamic Balance System provides for the measurement, grading, marking and sorting of tires to meet these requirements. The AkroDYNE® Truck Tire Dynamic Balance System is a fully automatic machine used for 100% tire checking in production. 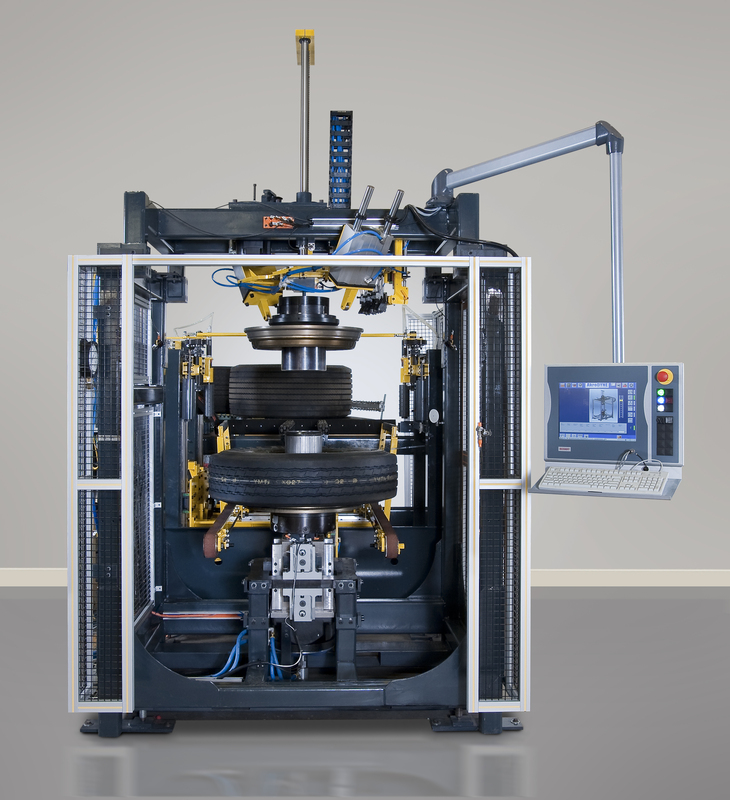 It can automatically adjust to different tire widths and test conditions while processing a variety of tires with various bead diameters (adapter dependent), outside diameters, section widths, and weights. These features make the AkroDYNE® Truck Tire Dynamic Balance System a high up-time, high-throughput and ergonomically friendly machine. Key technology for AkroDYNE® and AkroDYNE® Truck are by protected by United States and International patents.